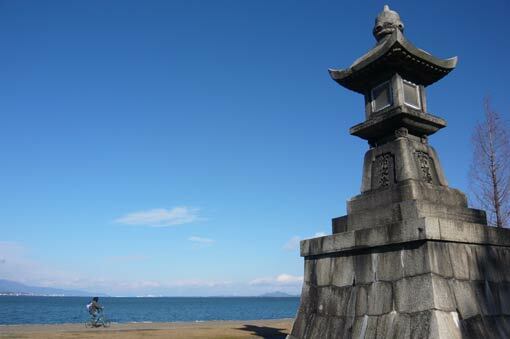 Got tired with concrete jungles in Osaka and tourist-packed streets in Kyoto? 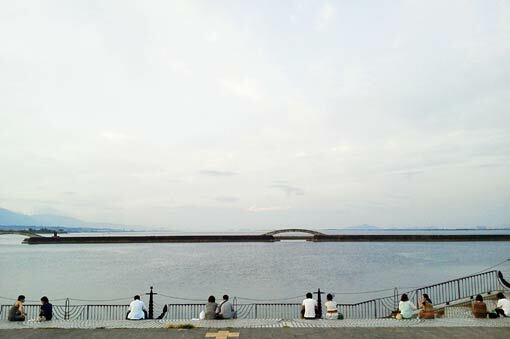 Away from the hectic atmosphere in big cities, Nagisa Park (literally Shore Park) in Otsu is a great place to catch fresh lake breezes and take a deep breath under the open sky. 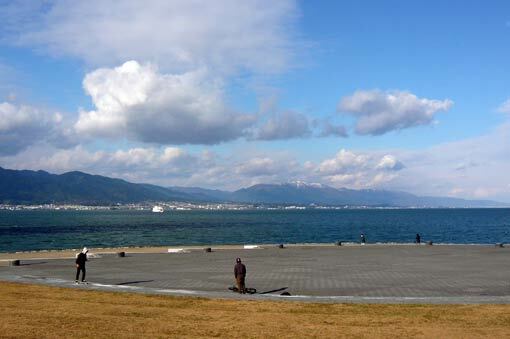 It is a waterfront park on the city centre of Otsu, the prefectural capital located at the southern tip of Lake Biwa. A 4.8 km-long series of open spaces stretches along the shore, providing the locals and visitors with vast areas for recreation and relaxation. 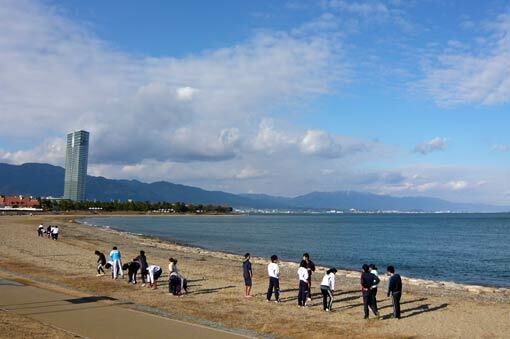 The whole stretch of the park boasts magnificent views of the great lake, backgrounded by the range of Mount Hiei and Mount Hira on the western coast, and on clear days, mountains far north to the lake. Most of the shore is sandy beach or boulders stepping down into the water which allows you to soak your foot in the lake. Besides a good viewpoint, the park is a good place to do some people-watching as well. Local inhabitants stroll out here to relax and to do some sports throughout the year. You can enjoy yourself wandering around and watching local people do; elderly couple taking a walk, high school students doing physical training, mothers chatting on the bench, kids playing around, boys waiting for a nibble on the hook, a young girls practicing a dance. To relax yourself, and to see local people relaxing, why don’t you come to this easily-accessible open-air haven? ?